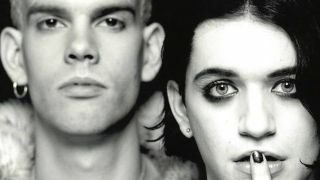 Placebo have released a new video for their cover of Talk Talk track Life’s What You Make It. The song appeared on Placebo’s 2016 EP of the same name, with the new promo filmed in Agbogbloshie – a former wetland in the heart of Accra, Ghana, which is home to one of the world’s largest electronic waste dumps. Molko says: “The band would be robots playing instruments and that e-waste would replace nature, as it appears to be doing only a few decades after the song’s original release. “The only director who actually came back to us with a treatment about e-waste was Sasha Rainbow. I called her up to sound her out and discovered that I was speaking to a very brave and passionate woman. Rainbow adds: “The two boys in the film live in this extraordinary place which for me, highlights a human’s ability to adapt with incredible strength, resilience, and humanity. “I hoped to capture the environment in a dreamily meditative way that would at once juxtapose and yet synergise with the theme of the song, and glimpse at part of the repercussions of our current technological revolution. Placebo have released the video to coincide with the announcement that they’ll tour across the UK in October for a run of 11 dates. Tickets go on sale from 9am on June 7. Find a full list of shows below.